The Panasonic G7 Compact System Camera! I already own the Panasonic G6 which delivers excellent image quality BUT this new Panasonic G7 Micro Four Thirds compact system camera is tempting, especially in its silver livery. There have been some negative comments about the block styling of the camera body but I like it and it makes for a refreshing change. The G7 does offer excellent 4K video with the ability to freeze a single image frame (in camera) and also (I suspect) using a decent video editing software package. In any case, the camera body that I really like is the silver one and that can only (apparently) be purchased with a Lumix 14-42mm (28mm-84mm field of view) OIS zoom kit lens from Jessops in the UK - it comes in at £679.00 vat inclusive on pre-order. 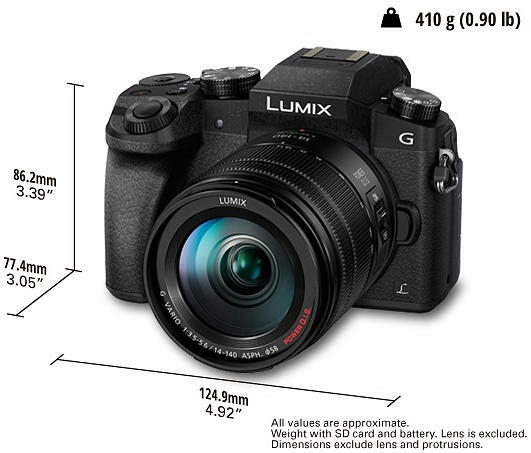 The Full Specifications of the Panasonic G7 camera are very impressive and coupled with excellent manual controls this is a camera that all photographers can use with the right lenses for portraiture, landscapes, wildlife, sport and street photography. Even with a Lumix 100-300mm f4/f5.6 OIS Zoom Lens (200mm-600mm field of view) fitted the combination remains relatively compact and lightweight for travel use, wildlife and sports photography. A Panasonic Micro Four Thirds compact system camera is so much fun to use and all that a photographer requires, even for niche photography. A camera like the G7 can be carried around in one hand all day with only a wrist strap as backup should you accidently drop it. If you are serious about owning just one camera with a few good lenses then the Panasonic G7 should not disappoint - my older G6 variant is a blast. I already have some nice Lumix lenses but the one that I would really like in my bag would be the LEICA DG NOCTICRON 42.5mm / F1.2 ASPH. / POWER O.I.S. Prime Lens with it's 85mm field of view and which (unfortunately) costs around £1,099.00 vat inclusive in the UK. From the Internet - "The Panasonic F1.2 ASPH Leica DG Nocticron O.I.S. 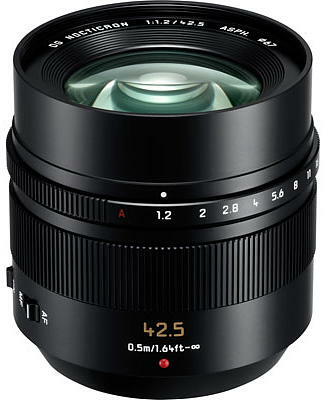 Lens for the Micro Four Thirds system is a fast portrait lens with maximum f1.2 aperture and Optical Image Stabilisation. The aperture ring on the lens barrel allows direct, intuitive control over aperture settings so you don’t have to take your eye off the subject and potentially miss the shot. Optical Image Stabilisation effectively compensates for any camera shake, ensuring your photos are crisp and clear, even in badly lit environments". The Nocticron is an awesome prime lens and although primarily designed for portraiture it's image quality is superb and it could also be used for street and landscape photography to pull in those distant subjects. 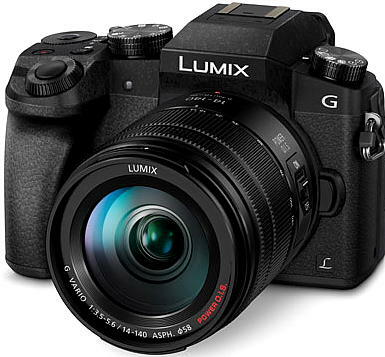 Panasonic G7 & Lumix 14-140mm ASPH OIS Zoom Lens! The Panasonic G7 Micro Four Thirds Camera with the Panasonic Lumix 14-140mm f3.5/f5.6 ASPH OIS Zoom Lens (28mm to 280mm field of view) makes for an excellent compact and lightweight camera system for street photography. The combination can be easily carried on a motorcycle - either slung over your back in a small carrying case or stuffed inside a backpack or rear seat bag. As well as being used for street photography, it is also ideal for pulling in distant landscapes, nature and sports photography as well as general use. The cream on the cake is of course is it's 4K video. The camera and lens comes in at around £694.00 vat inclusive in the UK. From the Internet - "The Panasonic LUMIX DMC-G7 combines stunning 4K (30p/24p) video, high resolution stills and a variety of practical new enhancements to help anyone capture the perfect image. Ideal for the aspiring photographer wanting to take their photography to the next level, the 16-megapixel Panasonic G7 is designed for ease-of-use without compromising on performance. The camera brings a variety of standout features including a built-in 2,360,-dot OLED viewfinder, 3.0" 1.04m-dot resolution free-angle touch screen display, improved autofocus, 8 fps burst shooting, Wi-Fi connectivity and a new 4K Photo mode that allows you to extract 8-megapixel stills from the 4K footage in-camera so that you never miss a moment". 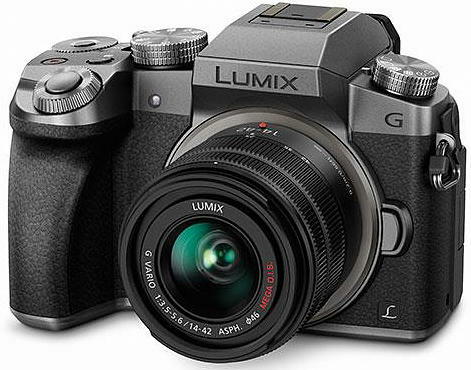 You have to hand it to Panasonic, they have stayed true to the compactness of their G Series of cameras and the new G7 offers a great deal of photographic power in a lightweight and compact package. The size is not too small and not too large whereby the manual controls are relatively easy to use and yet the camera and a couple of Panasonic Lumix Lenses does not require a huge bag. The G7 camera body measures in at 4.92" in width by 3.39" in height by 3.05" in depth (not including the kit lens and protrusions) and weighs in at 410g. A large part of the body 3.05" depth size is taken up by the grip. I have made some image comparisons between the Panasonic G7 and my current Panasonic G6 but there is no gain in image quality with the newer G7; in fact my G6 seems to have a slight edge in the higher ISO 1600-3200 bands.